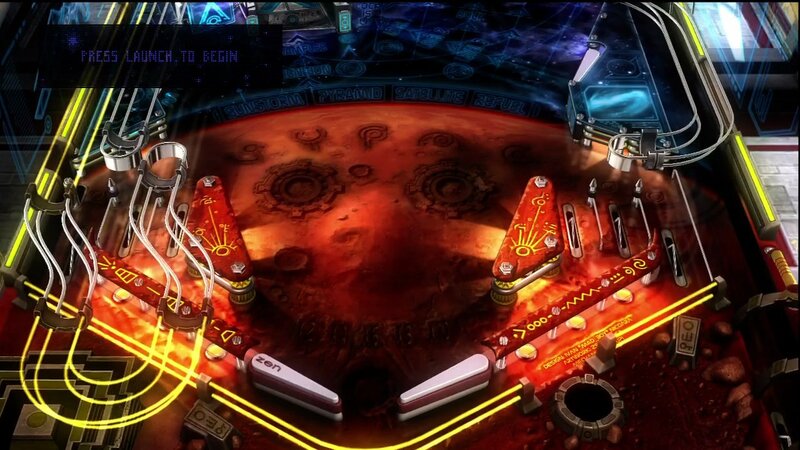 First with the core tables, then with the Marvel Tables, Pinball FX 2 has proven to be the gift that keeps on giving. This most recent table adds a space themed table, Mars. The bar has been set pretty high by previous DLC. Will the potent combination of the silver ball and the red planet continue the legacy? As with the earlier tables, elements of the table flirt with photo-realism at times. The board is layered with effects of two distinct varieties. 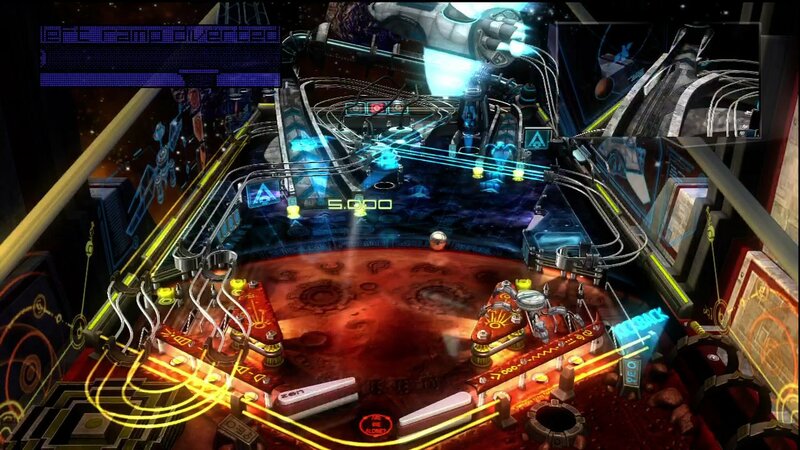 The first are the standard elements of a physical pinball table: flashing lights, moving bumpers, an animated info screen. The other effects take advantage of the digital nature of the board. 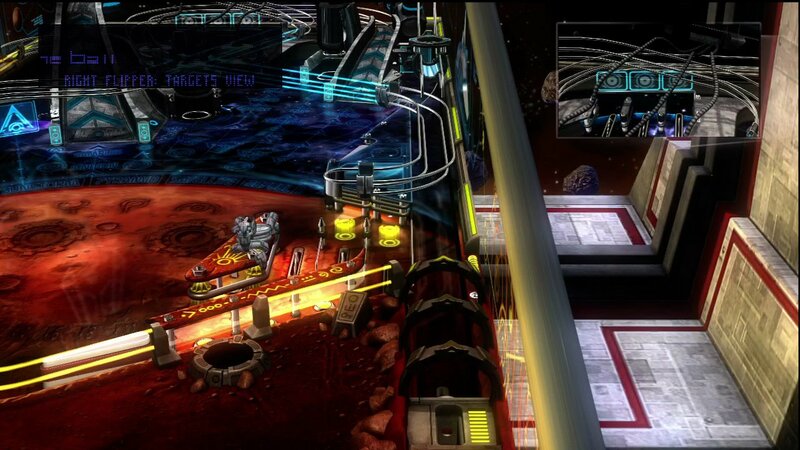 These include laser rings trailing behind your ball when it rolls down the center ramp, a spiderbot we’ll talk about later, and spacecraft sweeping over the playfield. Once you fulfill certain criteria, for instance, a futuristic shuttle will fly in and settle down, rumbling the board as it does. The effects are neat, and join the useful camera shifts and action cams that we’ve discussed in other reviews of other tables. Good to see they are keeping up the good work. Again, I don’t have much to say here that I haven’t said in my other reviews. The play is deep, far deeper than I’d ever realized that a pinball table was capable of providing. Reliably delivering the ball to the appropriate targets to progress the game through to its various bonus rounds takes a skill that I simply don’t have, unfortunately. That isn’t to say that the table isn’t fun for a novice. Even without reaching the “end game” of the table, I was still enjoying myself. I’ve no doubt that with time and dedication I could have developed the Tommy-level skills that it would take to master the table. For those of you who fancy yourselves a pinball wizard, though. Do yourself a favor and give this table a try, since as always the demo is free. I think you’ll find it a worthwhile test of your talents. There wasn’t really much in the way of novelty this time around. That’s not really a mark against, considering the quality of the overall game. I’m just saying that, rather than thinking of this as a new and improved table, think of it as more of a good thing. 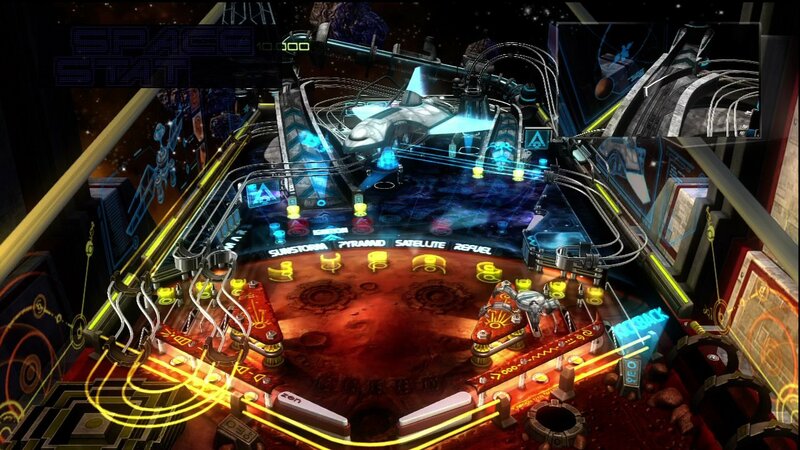 Close your eyes and try to picture what an actual pinball table with a space theme would sound like. That’s what this sounds like. They hit the nail on the head in terms of authenticity, with space-age music playing along in the background and game events narrated by robotic voices or ground control transmissions. Certainly the sound us among the least important aspects of the pinball experience, but rest assured that they didn’t skimp. Joining you on your flipper based exploration of Earth’s red neighbor is a spider robot that prances all over the surface of the table. It is clearly your helper, activating the kickback and ball save to get you back in the game, but something about it bothers me. When you finally lose your ball, the bot shakes its head, shakes with automaton laughter, and otherwise mocks your failure to the fullest extent that a mute, weakly anthropomorphic robot can. It reminded me of the dog from duck hunt… I hate that dog. 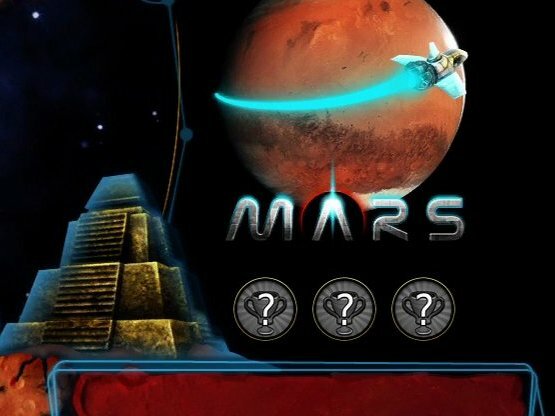 Not unlike our recent reviews of episodic games like BTTF, Mars is an extension to the gameplay of an already proven game. If you are a fan of pinball, then by now you should already know that PFX2 is your best bet to feed your need in the most authentic and effective way possible. 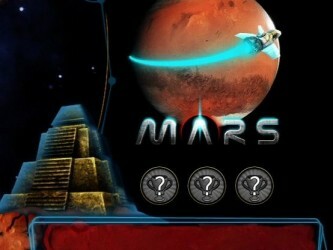 Mars is simply the most recent dose, and a hearty one at that. Look at him, lying there, looking bored... Lousy mechanical insect. 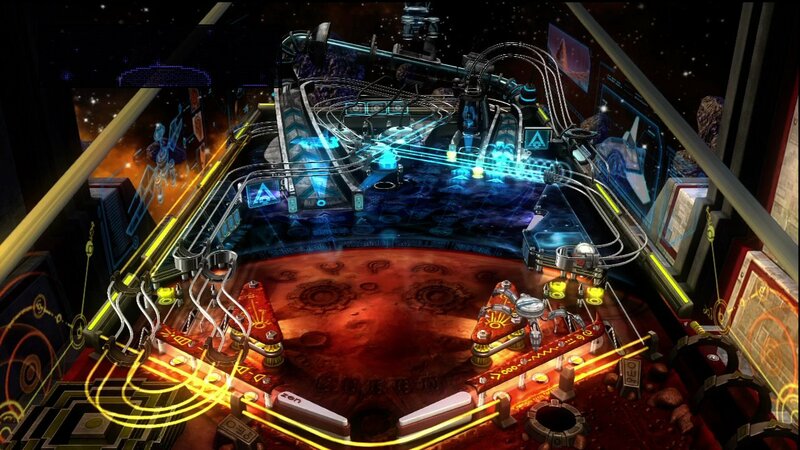 8.0 / 10: If you’ve got the skill or the patience, this new table will prove itself to be an excellent addition to the already impressive roster of Pinball FX 2. If you don’t like how I play, you can get off the table, Spiderbot. Look at him, lying there, looking bored… Lousy mechanical insect.